I've been lucky enough to put together a few awesome product reviews lately. I typically share educational products on my blog, and only those that I really genuinely like and would honestly recommend to my readers. 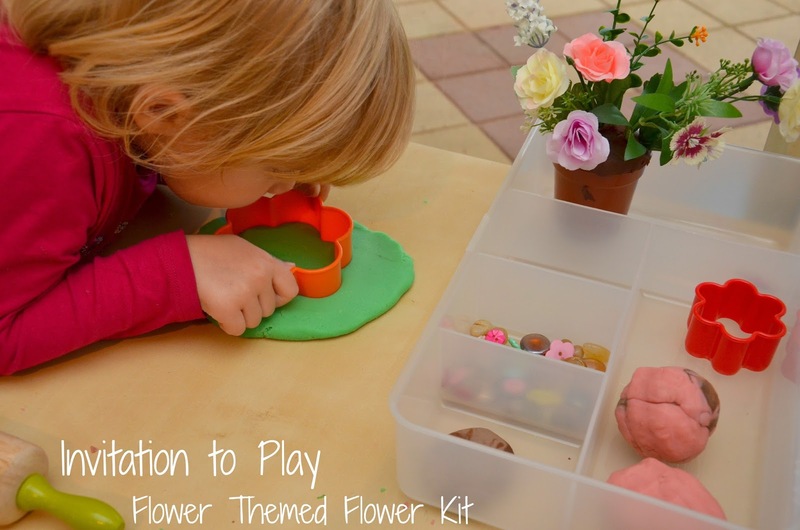 I'm so excited about today's product review - the flower play dough kit from Invitation to Play. 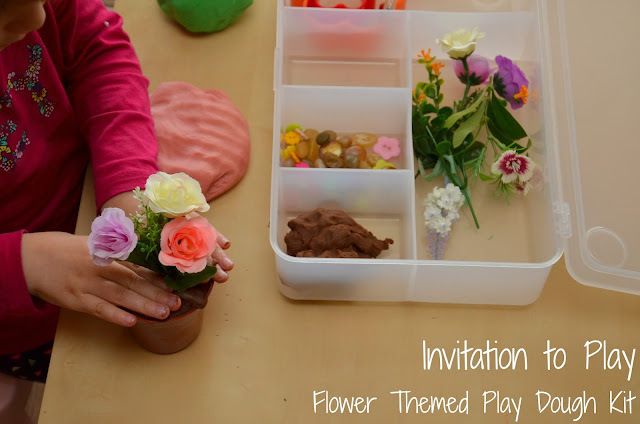 An 'invitation to play' is a carefully put together collection of materials designed to allow for open-ended and encourage creativity. Being beautifully presented and 'inviting' is they key to draw the child in and capture their attention. Two lovely teacher/mummies from Adelaide launched their business Invitation to Play earlier this year, and I was thrilled to meet them at the latest Lollipop Markets. 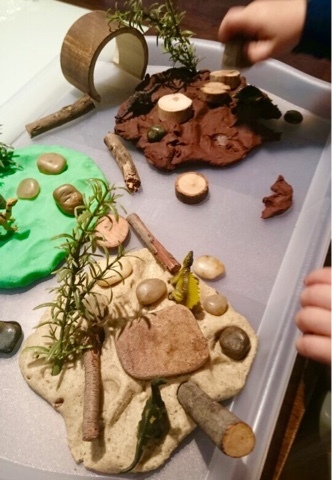 Inspired by the Montessori and Reggio Emilia philosophies, they have combined sensory and nature play into their kits and products. Miss M chose the flower kit, and here's a glimpse of what she got up to... (kindly gifted for the purpose of this review). Spending time playing with Miss M (3 years) reminded me at how amazing and creative children's imaginations are. The next thing I knew, Princess Holly was going on a bear hunt through the squelchy mud, the wavy grass, and forest of flowers. Her dad came over to join her and it somehow turned into a restaurant with ravioli, ice creams and macarons! "I'll be a chef mummy, what would you like me to make?" 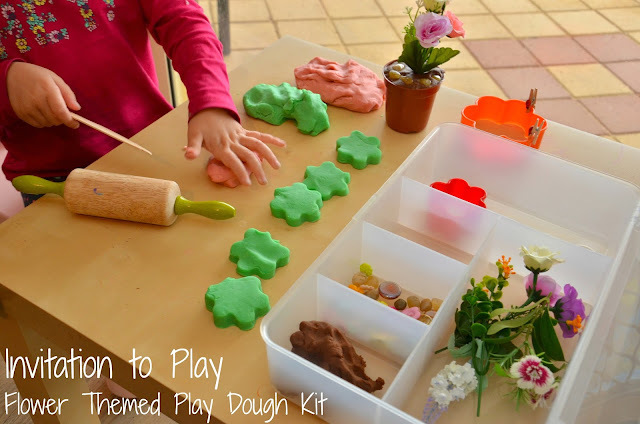 Miss M briefly went back to the garden theme for a while when she rolled the play dough to make some wiggly worms. With a little more guidance from me we made a big green flower and three small pink ones with special decorations. Finally, just before pack up time, the chocolate scented play dough had become chocolate ice cream that she was feeding to her doll. I'm not the only one who loves Invitation to Play! My 2 year old nephew got the dinosaur kit and it was a big hit with him! 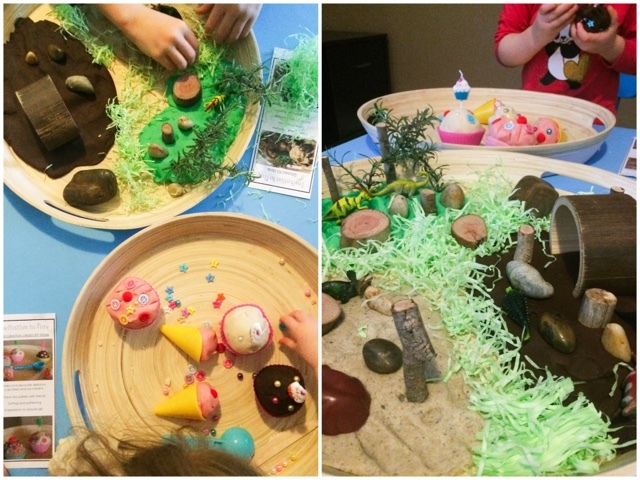 He liked stacking the little round wooden pieces on top of each other, pressing the pebbles into the play dough, making dinosaur footprints in the play dough and lots of dinosaur roaring! 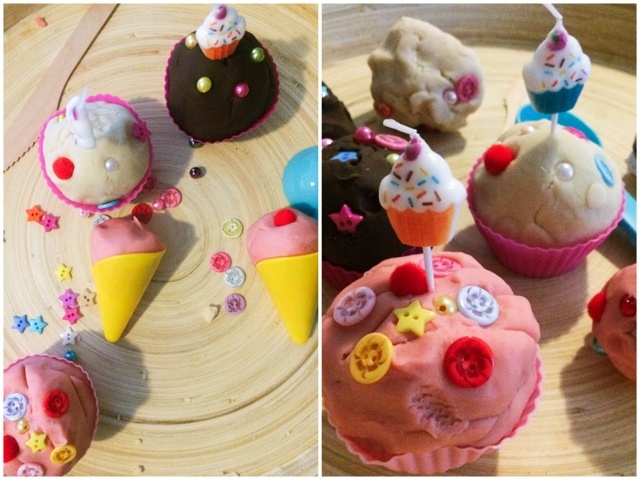 Sarah from Working Mums Collective has a 3 and 6 year old who love their kits as well. Pictured here is the dinosaur kit and cupcake/ice cream kit, and she tells us her kids were kept busy for hours! Other themed kits available include construction, ocean/beach, farm, insects and safari. Custom orders are also welcome. 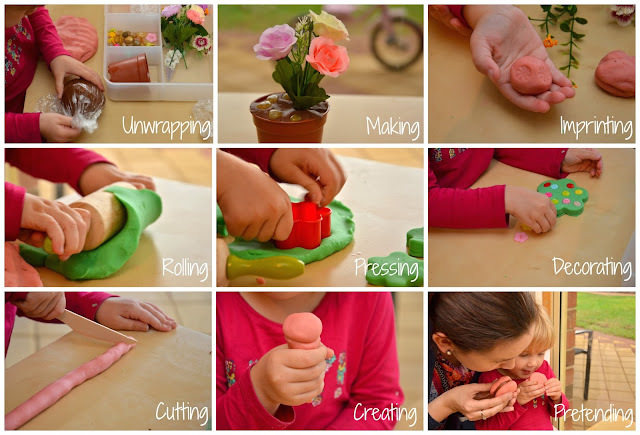 The themed play dough kits from Invitation to Play are put together with care and an attention to detail. A delight for the senses and a beautiful play experience for young children. If you'd like to place an order, check them out on Facebook here - have a browse through their products and send them a message. You can also find them on Instagram. Friends who have kids with birthday's coming up... you might just end up with one of these from us!! Thanks again Suze & Laura from Invitation to Play for collaborating with me to share your wonderful products with my community. These look awesome! Love the idea of themed playdough kits. They really are lovely Toni! Kept Miss M busy for ages! very pretty. Playdough really is amazing! The ways the kids can use it seem endless! Suggest me please, looking to hear from your soon.